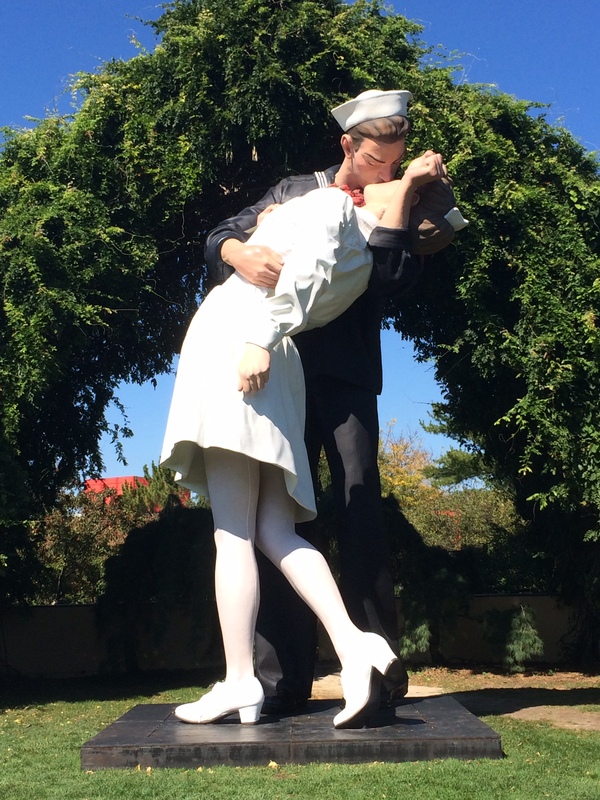 Forever Marilyn is part of the Seward Johnson, The Retrospective exhibit at the Grounds for Sculpture in Hamilton, N.J. 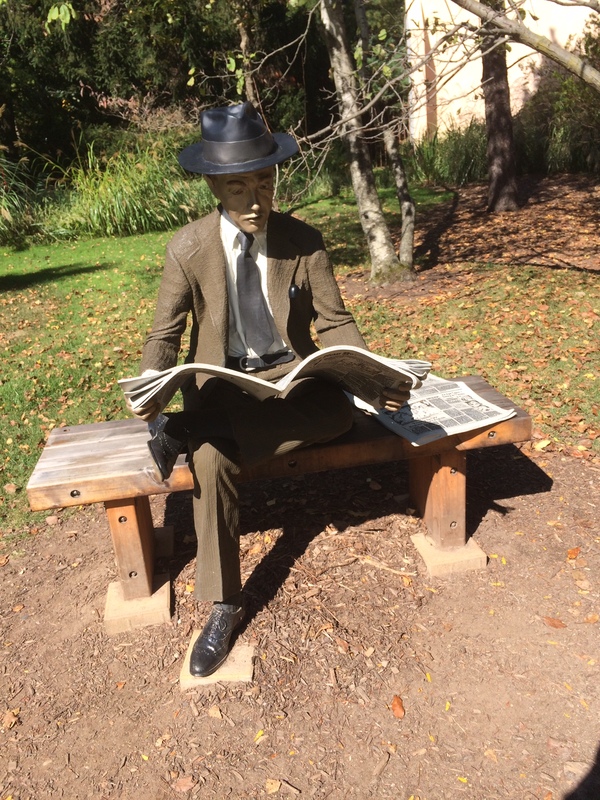 The 84-year-old New Jersey native was the founder of the Grounds for Sculpture in 1992. More than 150 of his works are on display. The exhibit was scheduled for the summer of this year but it has been extended and will continue until July 2015. Forever Marilyn, completed in 2011, is part of Johnson’s icon series. Other works in that series, Return Visit, God Bless America and Unconditional Surrender, are shown below. All of the works shown above are enormous. Forever Marilyn is 26-feet high and weighs 17 tons. Also on display are a number of Johnson’s life-sized sculptures, part of his Celebrating the Familiar Series. 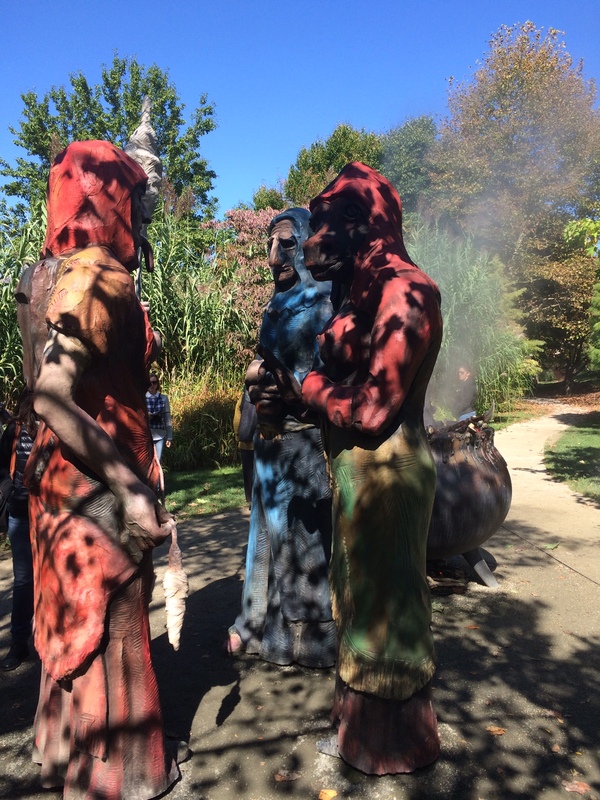 As you walk around the Grounds for Sculpture, these works will sneak up on you. From a distance they look like park visitors, seated on benches or standing beside the road or paths. 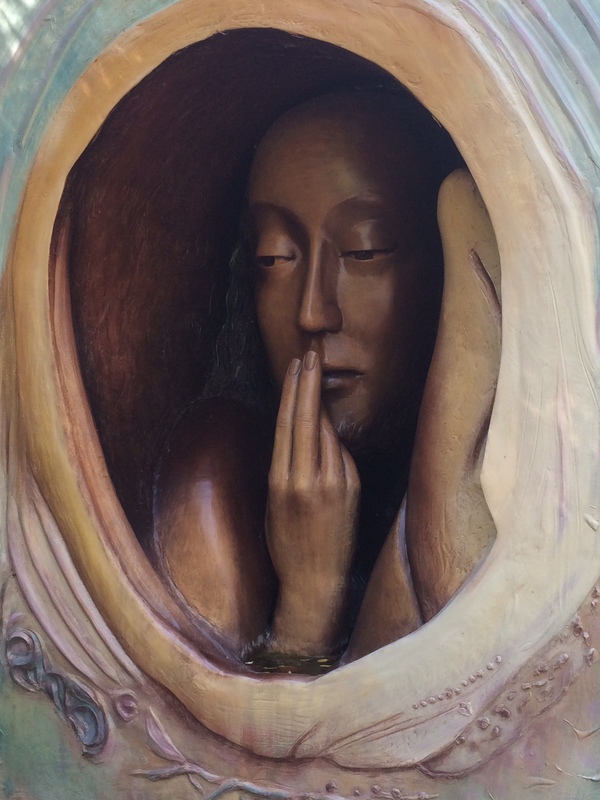 So many times during my visit I was surprised by a person that was actually a sculpture. What distinguishes Johnson’s work is the vibrant color, not something that is all that common in a sculpture exhibit, and the minute detail. Note the headlines on the newspaper and the spokes and chain on the bicycle. The attraction here is not just the art, the grounds are also pretty nice. In places it is like hiking in the woods or taking a lakeside stroll. The art is installed in such a way that it almost seems embedded in the grounds, as if it was conceived with this environment in mind. 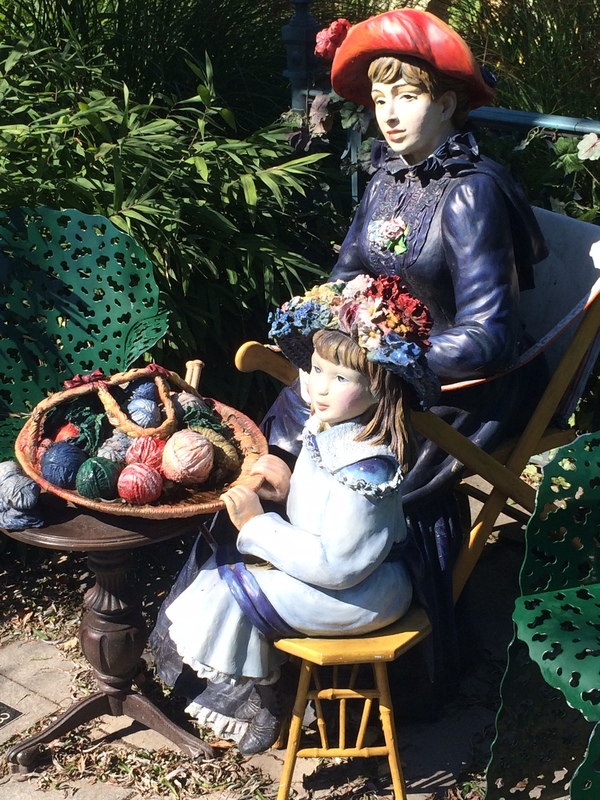 The Grounds for Sculpture has plaques on many of the pieces inviting visitors to touch. That is true of most of Johnson’s works. Several of his large pieces have been installed on the roads surrounding the museum. Since this is primarily a drab industrial area the sculptures on the side of the road or in front of the buildings are striking. The God Bless America piece shown above sits next to the main road leading to the Grounds. There is an excellent restaurant on the premises with a full menu and prices that are modest considering the qualify of what they serve. Only downside is the name, Rat’s. 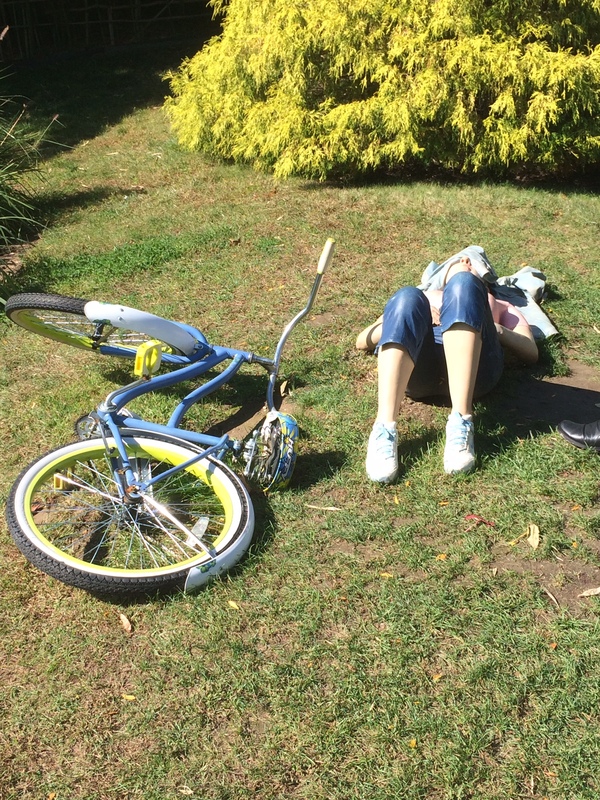 This entry was posted in Art and tagged art, Grounds for Sculpture, sculpture, Seward Johnson. Bookmark the permalink. Although this is not models on a walkway or pictures of fashion hits, I think this exhibit is very fashionable and cool to boot. 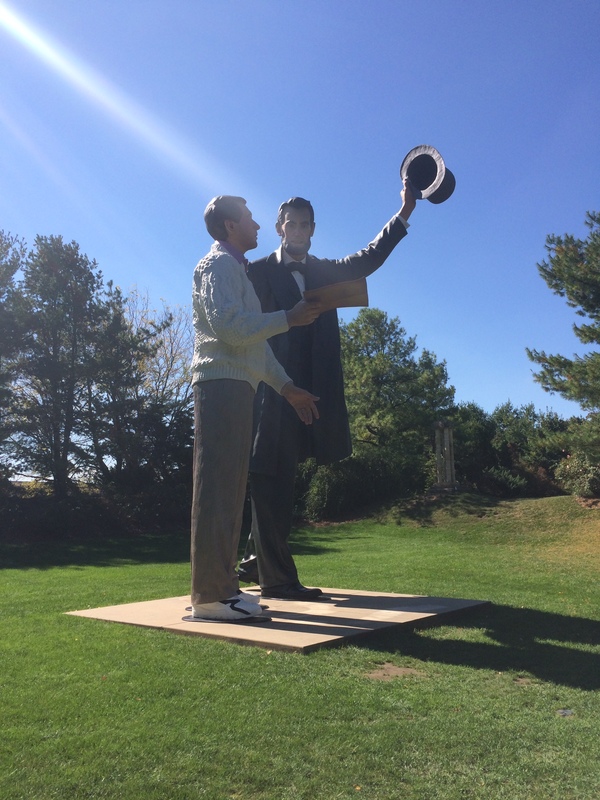 The exhibits of Seward Johnson very hip – I would like to see these sculptures in person. Max has directed me to this. Interesting topic. What marvelous pieces! 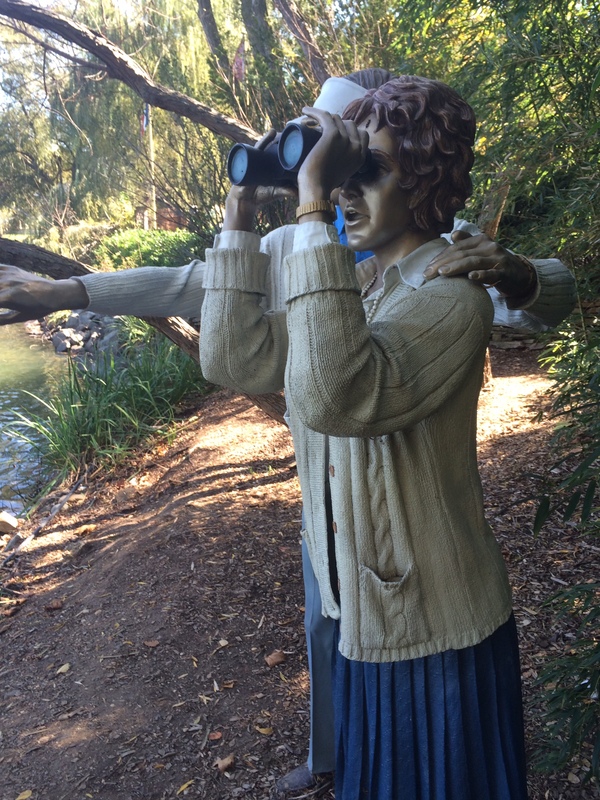 It’s fun to come upon sculptures that had seemed to be real people. I’d love to visit. I am in two minds when it comes to sculptures that are painted. They appear to me to come across as temporary and more on the tacky side; hiding the true artistic nature behind the layers of the unnecessary. That said, I found some of them to be very cool, Chamber of Internal Dialog, Newspaper reader, and Three Fates. I love the whole idea of a park though and my apologies if I sound like a curmudgeon. Many critics have made similar comments about Johnson’s work. I’m less of a purist. Chamber of Internal Dialogue is actually a small hut like structure. My photo only shows one external wall. Fascinating sculptures. I like the idea of seeing them in a park. I’d like to visit this exhibit. Thanks for this – fantastic post!! I really like these sculptures. So often sculptures seem so contrived but these are much more appealing. I think it would be wonderful to walk through the park and sit down beside the ‘newspaper’ man or come across Marilyn in her famous pose. These would add so much more fun to the whole walking in the park experience. Very neat! I’d be amazed if I accidentally walked upon these. My kids would be SO excited to see things so big. Yes. One crowd favorite was to stand under the giant Marilyn and have your picture taken looking upward. A true pop sculpture moment. Very nice Sculpture. Some are big and some are so close to real man, It is nice to be in a place that has so much beautiful surprises to offer when you walk around. It is also nice that the ground is maintained properly and also there is a restaurant. I was wondering for last photo Three Fates still there is smoke , do they burn woods daily or any kind of lightening ??? There’s a caldron with what appears to be smoke but it is actually a very fine mist. What comes to mind is “a Madame Tussauds” for sculptures. Most likely that’s where the inspiraton for the sculptures in the pictures came from. I had no idea these grounds existed. Hamilton NJ is not that far from me so I think it is worth taking a look art. I think what is interesting is how Marilyn Monroe is still of interest today. The dress blowing up over the grate will be forever embedded in our minds. The sculptures look great. I live about 50 miles away and I had no clue it existed either until I saw a review for this exhibit. 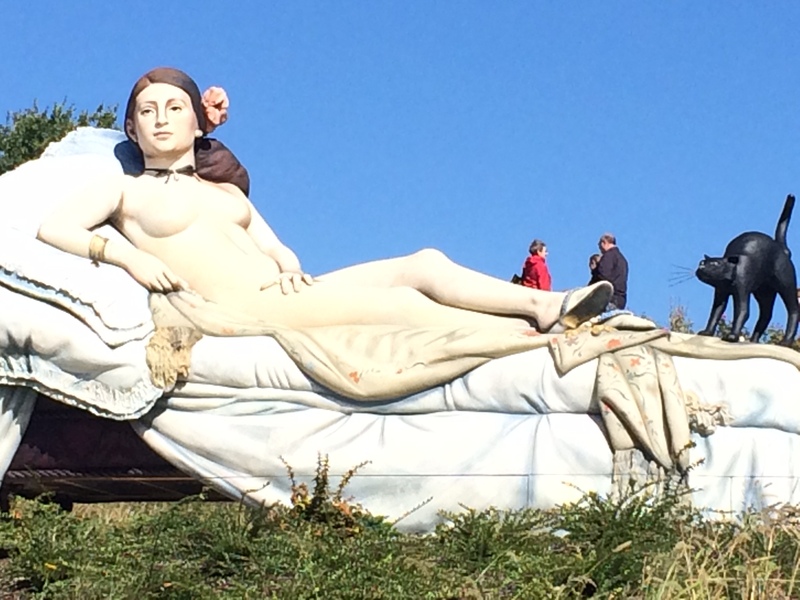 Hamilton isn’t exactly the kind of place you expect to find a sculpture park. Apparently it has been there since the 90’s. Hi Ken! What an interesting place! I’ve bookmarked it as a place I’d like to visit someday when my kids are older. I can’t believe Marilyn is 26 feet tall! When I looked up the website on Google, “rats” came up which was a bit unnerving until I saw it was the restaurant. Ha ha. Thanks for introducing me to a new, unique place to visit. This looks really neat. I can see where it would be unnerving to happen upon someone you thought was a human and find they were a sculpture, or vice versa. It’s interesting how the scale of the large pieces really makes you think about them differently. Thanks for the tour! Highly deceptive but artistic and beautiful work there Ken. I almost thought it was a photo of Marilyn only to see after a while it is not. This is amazing work and very creative. Love it. Thanks for sharing, they are incredible, and so detailed. Oh, I love art that works with an environment. It makes the piece so much more impactful, especially when it’s unexpected. 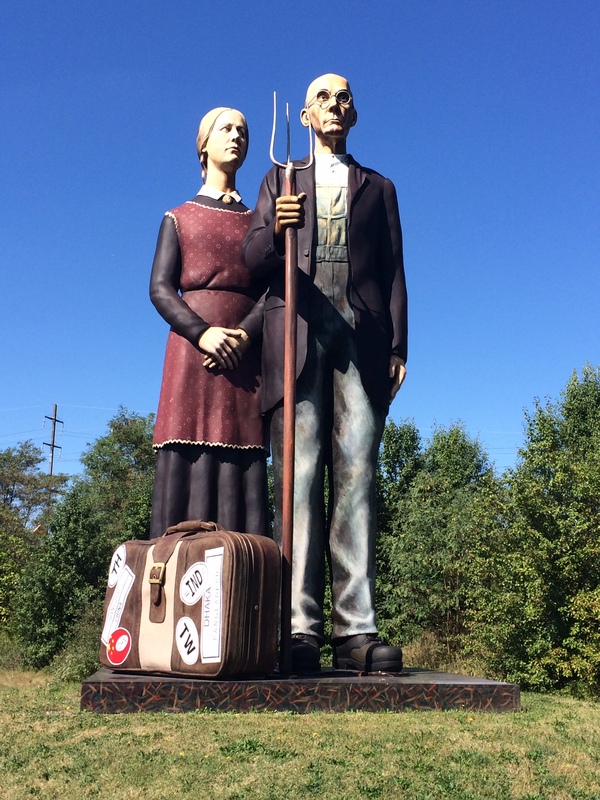 Although the interpretations of Marilyn, Abe, American Gothic are spectacular, I particularly love the “Grabbing Some Peace,” as it could easily be mistaken for someone lounging on the grass! I loved that one too Krystyna and my picture doesn’t really do it justice. Sitting on the guy’s chest is this incredibly detailed image of a cell phone as if he fell asleep looking at his phone. I would love to see this in person! 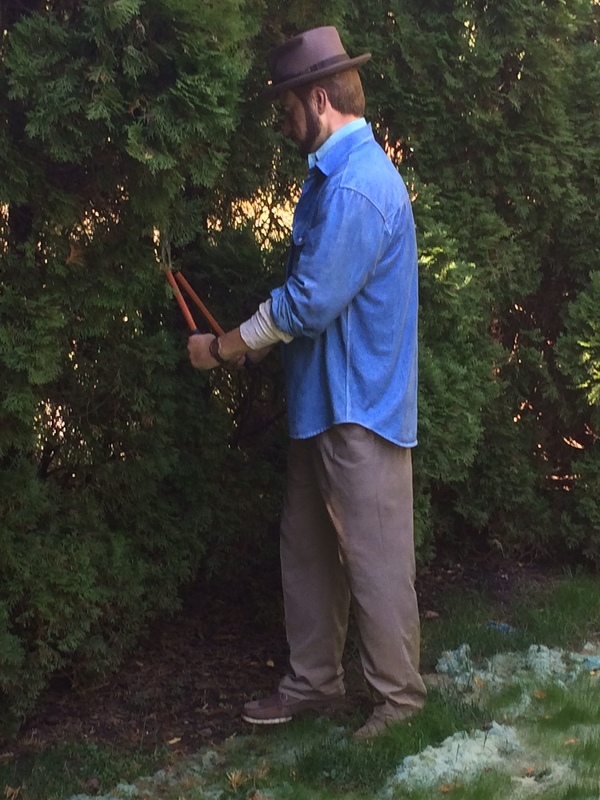 I have encountered a few sculptures that I thought were real people. That shows how good they artist is. Absolutely beautiful and interesting. I may have to make a stop on the way to visit family in CT as I travel north from Philly.